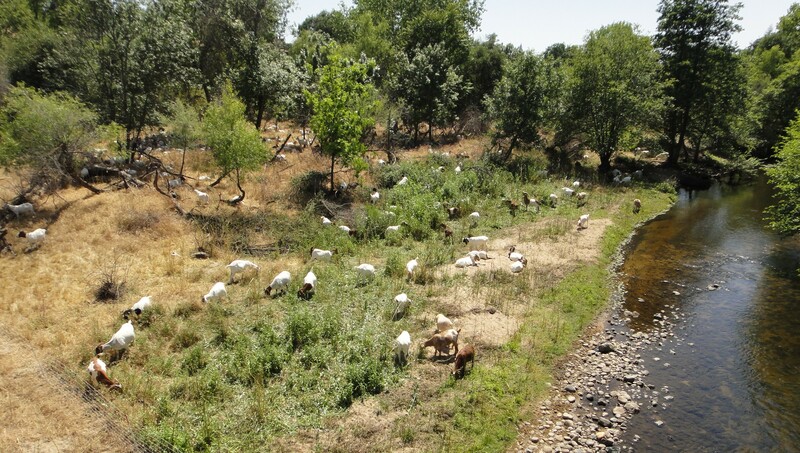 The goats came through the Dry Creek floodplain again this year and did a fine job of brush cutting; it would have taken George W. Bush all year. If the trees have slanting branches, as above, the goats can climb the trees, stripping off everything. This shot of misnamed Dry Creek was taken a few months back; it’s closer to actually being dry right now. Per the City of Roseville: A forced intensive livestock grazing method is employed to achieve the desired vegetation management goals. 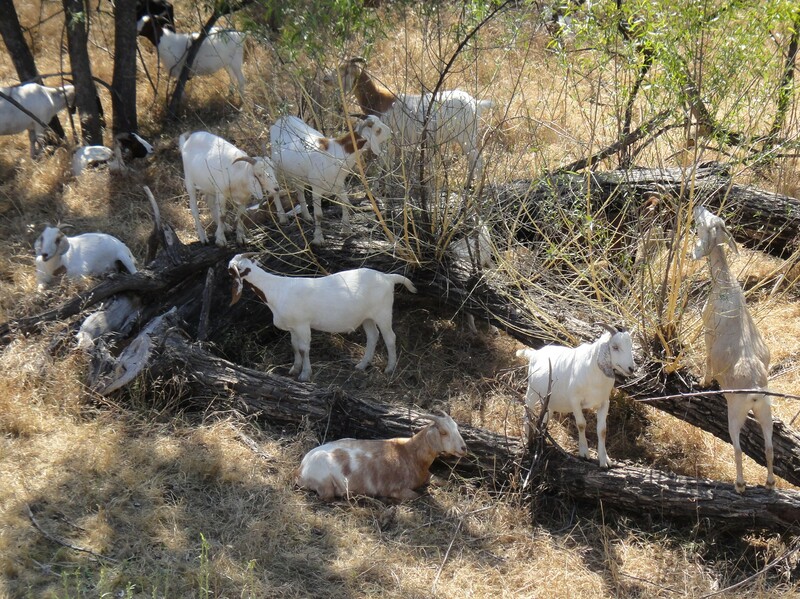 Specifically, the goats will graze a 30-foot firebreak between the homes and the open space, thus reducing the fuel load and ladder fuels creating a defensible space. The animals eat primarily twice a day beginning early in the morning. During the day they will rest. They will start up again in the early evening until they bed down for the night. Goats consume 5% of their body weight each day making them one of the most efficient, cost effective and environmentally friendly tools available. 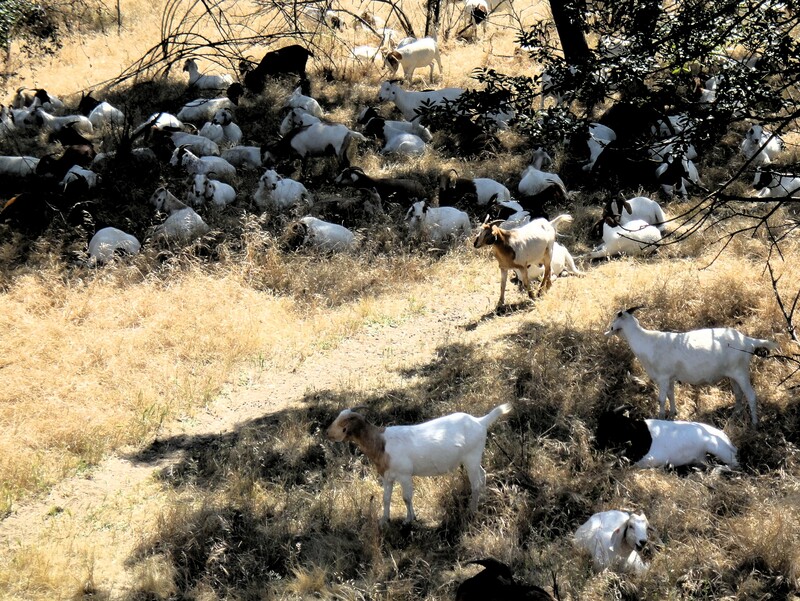 On average, 100 goats will clear approximately 1 acre a day. 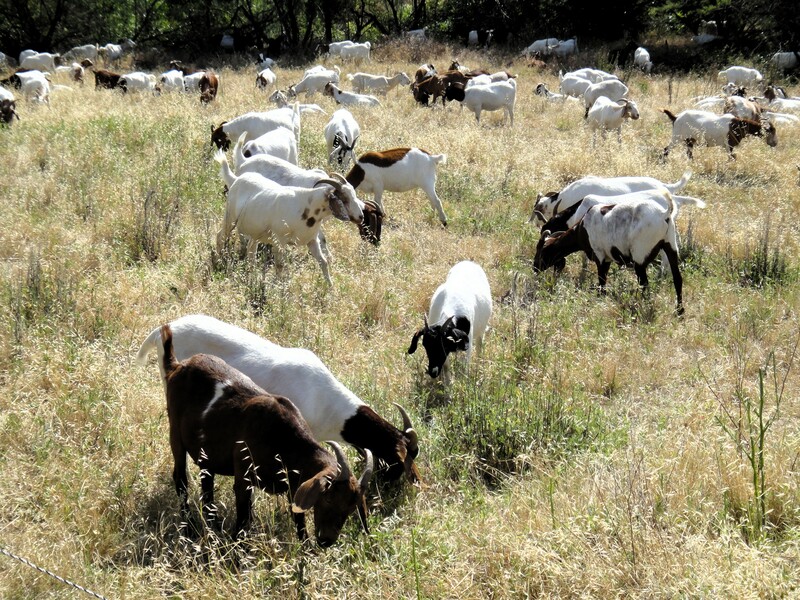 The city cautions local residents to leash dogs and control children around the solar electric fences and don’t feed or annoy the goats or the dogs. 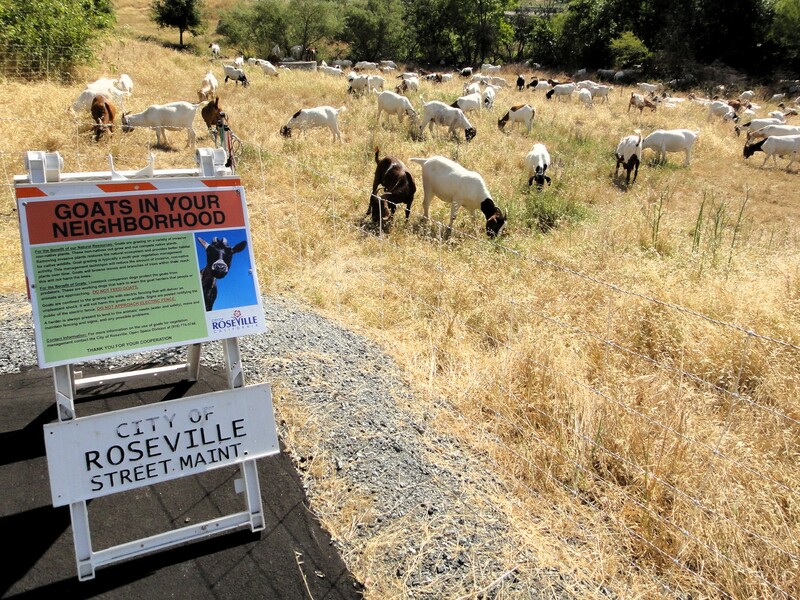 The goat program is quite popular in Roseville as an alternative to the loud and polluting power tools usually seen and heard on Dry Creek. The city workers do a fine job but then so do the goats, leaving only dry, mild smelling pellets that dissolve in the rain-if we ever get rain- making for fine fertilizer. Of course I mean the goats leave the pellets, not the city workers. Unless otherwise noted, text and images produced and copyrighted by todgermanica.com and are free for noncommercial use with attribution. Any advertisement you see here is chosen, placed and monetized by WordPress. I am not consulted nor compensated. I think this is a totally fabulous, environmentally friendly, and economic program, on so many levels. Bravo to the city of Roseville!